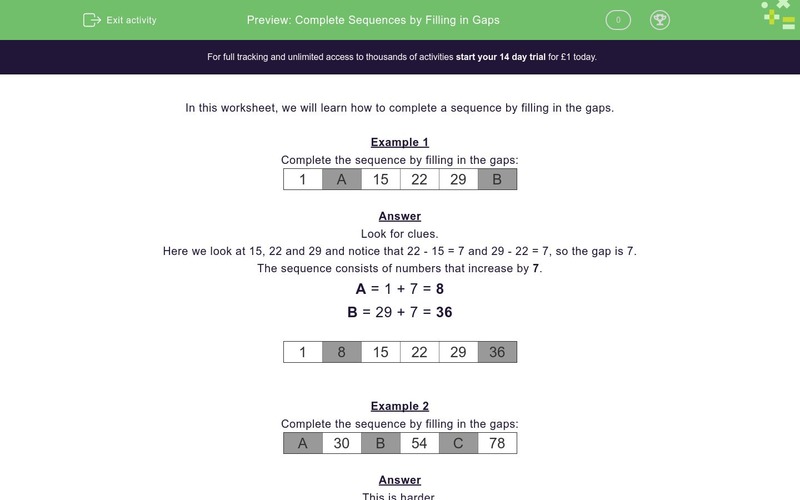 In this worksheet, students must fill in the gaps in the given number sequences. In this worksheet, we will learn how to complete a sequence by filling in the gaps. Here we look at 15, 22 and 29 and notice that 22 - 15 = 7 and 29 - 22 = 7, so the gap is 7. The sequence consists of numbers that increase by 7. 78 - 54 = 24 also. The gap will be half this, i.e. 12. The numbers increase by 10 each time. The numbers increase by 9 each time. The numbers increase by 14 each time. The numbers decrease by 13 each time. The numbers decrease by 15 each time. The numbers decrease by 11 each time. The numbers decrease by 12 each time. The numbers increase by 13 each time.